We’d love your help. Let us know what’s wrong with this preview of Sabbath by Wayne Muller. Millennia ago, the tradition of Sabbath created an oasis of In today's world, with its relentless emphasis on success and productivity, we have lost the necessary rhythm of life, the balance between work and rest. Constantly striving, we feel exhausted and deprived in the midst of great abundance. We long for time with friends and family, we long for a moment to ourselves. To ask other readers questions about Sabbath, please sign up. Hi Community! If you were facilitating a small group studying "Sabbath" what key points would you enjoy being a part of the discussion? Thanks! I had Digital Sabbath #3 yesterday. I turned off my phone and computer Friday at sundown and didn't turn them back on until Sunday morning. I'm starting to enjoy the pattern and had a lot of relief yesterday from the complete disconnect. We had dinner at our house with friends Friday night, Amy and I did some stuff in the morning together, I went for a 9 mile run, took a nap in the afternoon, and we had dinner last night with friends and then watched some comedy on tv afterwards. My brain was le I had Digital Sabbath #3 yesterday. I turned off my phone and computer Friday at sundown and didn't turn them back on until Sunday morning. I'm starting to enjoy the pattern and had a lot of relief yesterday from the complete disconnect. We had dinner at our house with friends Friday night, Amy and I did some stuff in the morning together, I went for a 9 mile run, took a nap in the afternoon, and we had dinner last night with friends and then watched some comedy on tv afterwards. My brain was less chaotic yesterday and I was able to settle into a calmer state over the course of the day than I had been the previous two weekends. Last weekend a read a book by Wayne Muller called Sabbath: Finding Rest, Renewal, and Delight in Our Busy Lives. I was a little apprehensive about the book, but it was recommended by a few people including Amy. It was extraordinary and just what I needed to begin to understand the need for a real day of rest out of every seven days. While I'm not religious, I've got a strong jewish identity. I've also lived in Boulder for 17.5 years so it's hard not to be spiritual. I found as I read the book that I was able to abstract away all the religious references, especially since Muller provides a nice mix of jewish, christian, and buddhist quotes and thoughts. He isn't bashful about tying the idea of a day of rest back to religion, but he isn't dogmatic about it, nor is it the dominant thought. Instead, it's just additional support for the idea from many different cultures and times. Muller broke the book up into six sections - rest, rhythm, time, happiness, wisdom, and consecration. He then ends with a chapter on the actual sabbath day. Each section has examples and exercises - it's an easy book to read in one sitting as the tempo of the book is consistent, and the rhythm of each section is enjoyable. The bonus so far from starting on Friday night is that when I wake up on Sunday I feel rested and in a totally different mode for the "rest of the weekend" than I normally do. And I have no real "I need a weekend" feeling on Sunday as it's still a relatively chill day, although one that has some work and all the other stimuli of my world woven into it. This book was a gift. I had never heard of the author, but was of the impression that this was a Christian presentation of Sabbath rest. That is not the case. This book most definitely was not written from a Christian perspective. The author is Unitarian. It Mr. Muller's syncretistic effort to unify all traditions of 'rest' and place them neatly under the title of 'sabbath' (linguistic revisionism, but hey, if it sells books). For Christians, Jesus is the Lord of the Sabbath (Mat 12.8) and he is This book was a gift. I had never heard of the author, but was of the impression that this was a Christian presentation of Sabbath rest. That is not the case. This book most definitely was not written from a Christian perspective. The author is Unitarian. It Mr. Muller's syncretistic effort to unify all traditions of 'rest' and place them neatly under the title of 'sabbath' (linguistic revisionism, but hey, if it sells books). For Christians, Jesus is the Lord of the Sabbath (Mat 12.8) and he is therefore intended to be the center focus of the day. For Unitarians like Muller, the Sabbath is simply a day of rest, not much unlike a day at the spa. He recommends baths, with lots of bubbles, candles, and a glass of wine. He tells us of his friends Jules and Olivia who enjoy stripping down for some time 'sabbath' bath-time fun. Scrabble, champagne, and strawberries are another 'sabbath' essential. But Muller does mention Jesus, especially when compared to the historically oppositional religions. So for Mr. Muller, taking refuge in Buddha is like taking refuge in Jesus. Mr. Muller speaks of "becoming Buddha", along with taking time to "bless mother earth". He speaks of the Sabbatarians among the Native Americans, the Babylonians, Muslims, the Jews, the Buddhists, and many other various other religions. Other than a work of sociology for those interested in what Unitarians believe, I would not recommend this book for those of the historic and biblical-based Christian faith. I've returned to this book annually since it was first published, and always go away from it with something new. What worried or chafed before, a few years later, turned out to make sense to me in new circumstances. What seemed most profound, lived out over a few years, seemed everyday common sense. That's the thing about good books of spiritual practice: you meet them in different ways at different times in your life and they still have something to teach you, something to surprise you, somethi I've returned to this book annually since it was first published, and always go away from it with something new. What worried or chafed before, a few years later, turned out to make sense to me in new circumstances. What seemed most profound, lived out over a few years, seemed everyday common sense. That's the thing about good books of spiritual practice: you meet them in different ways at different times in your life and they still have something to teach you, something to surprise you, something to invite you to try understanding. Mellissa It is a re-read for me as well. Wonderful! I loved this book: my first introduction to Wayne Muller. In it, he explores all kinds of elements of our lives today and how we can find greater satisfaction -- delight! -- and greater peace within the madness of the world. What I love is that Wayne is both an incredible writer and has very thoughtful, well-researched chapters, each of which ends with a practical exercise to try in your life. Very helpful combination of reflection and action. Wayne Muller’s thesis is that Sabbath is good. He explores the fundamental need for rest, its origin in creation and its placement in major world religions. There is a fundamental rhythmicity to nature, Muller contends, and that is no accident. We are created to need rest; therefore Sabbath is created for us. As this is a natural truth, Muller finds much support from other faith traditions, with similar rest practices. Muller rests heavily on the creation account for his assertion that Sabbath is fundamental to all of nature. God finished the Creative work on the seventh day; in taking his rest, God created peace and rest for the world (37). He also points out that there is an ongoing quality to the Hebrew grammar – that God began to create, an action that continues, as Muller asserts in a circular motion. He sees creation and recreation in cycle (36). Another key theme Muller draws throughout the book is the goodness of creation. From the creation account he echoes God’s declaration that all God made is good. In this Muller finds much in which to rest. There is a fundamental goodness in us; Muller contends that, traces back to the goodness of its Creator. Call it what you will, inner light, hidden wholeness, Buddha nature, imago dei, there is something there that if we slow down we will touch the divine. I have little problem with Muller’s references to other religions. I am in agreement with his premise that Sabbath finds its root in creation. If it is indeed that foundational I would expect to find expressions of it in all religions. Those expressions can be edifying to us, especially for a practice we have so thoroughly erased from our culture. I hold to the evangelical view of the fall and the eschatology of the biblical apocalyptic literature. This, however, does not restrict me from agreeing with Muller that the earth, and all creation bear the stamp of the divine, especially we who were created in God’s image. It is then possible (while perhaps paradoxical) to find the goodness and glory of God, even in marred creation. Muller joins a conspiracy this week to return me to a renewed joy of rhythm in prayer. This week my family and I enter into intentional community with a couple that will be moving in with us. This has given me pause to think about the structure of our community (which we call The Parsonage). Inspired by this and the praying of the psalms in our retreat in everyday life, I have made praying the Liturgy of the Hours part of our communal life. Today I had a chance to introduce the practice to these new Christians. I also have enjoyed the monastic tradition of rest period after lunch. Our twitter account reminds us of our need to rest! Talk about juicy ecumenism. All in all the book itself was a sabbath read for me, and it was great to read it with school and whatnot going on. I disliked his inclusiveness, he was like a more dusty and vague Nouwen. On the whole however it was a much needed book for me to read. The elements of restful rhythm are quite a stern rebuke to American entertainment/consumerism. Peaceful book on rest but was not really written from the Christian or Jewish perspective but from the universalist, pluralistic perspective. It made it hard to read for me because while the concepts and stories about resting were peaceful and good, often pluralism was knocking on the door. If one could chew the meat and spit out the bones, this could be a book to read on resting well. I needed to read this book. I probably need to be regularly bashed about the head and shoulders with it, and read it monthly. My friends know my habit of over-scheduling myself--there are so many things I want to do and believe passionately about that I find myself busy beyond belief with absolutely no room for refreshment. "Sabbath: Finding Rest, Renewal, and Delight in Our Busy Lives" is a beautiful reminder of the importance of balance and rhythm in our lives. Wayne Muller encourages us to bui I needed to read this book. I probably need to be regularly bashed about the head and shoulders with it, and read it monthly. My friends know my habit of over-scheduling myself--there are so many things I want to do and believe passionately about that I find myself busy beyond belief with absolutely no room for refreshment. "Sabbath: Finding Rest, Renewal, and Delight in Our Busy Lives" is a beautiful reminder of the importance of balance and rhythm in our lives. Wayne Muller encourages us to build in time to refresh ourselves, whether it is just a few minutes peacefully unplugged from our electronics or a structured meditation. Worth the read. Helps me to realize that to "Remember the Sabbath day, to keep it holy." (Exodus 20:8) requires intentionality. The demands of our lives create our forgetfulness. A time and a way of resting from the world and toward our Creator is not only a commandment, but needed for the restoration and renewal of our soul. "Henri Nouwen was a dear friend of mine, a brother, priest, and mentor. He was also a fiercely asture observer of our worried, overfilled lives. Henri insisted that the noise of our lives made us deaf, unable to hear when we are called, or from which direction. Henri said our lives have become absurd -- because in the word absurb we find the Latin word surdus, which means deaf. In our spiritual life we need to listen to the God who constantly speaks but whom we seldom hear in our hurried deafness." "On the other hand, Henri was found of reminding me that the word obedient comes from the Latin word audire, which menas 'to listen'. Henri believed that a spiritual life was a pilgrimage from absurdity to obedience -- from deafness to listening." "In pursuit of knowledge, every day something is acquired. What a great practical read about Sabbath. Not limited to merely a day of rest but much more broad idea. Examples to incorporate rest in your daily life are at the end of each chapter. I would highly recommend this book! I actually bought a copy because this is the first book in my life that I wanted to highlight in! Though I'm not religious, the idea of Sabbath really resonates with me. I may not set aside regular time 'off' (not just talking about weekends here), but I certainly enjoy my down time. On one hand, I may feel as if I'm just being lazy--I should be doing 'something', but this book was a lovely reminder that this down time is a necessity. To reboot, relax, unplug, play (with others, music, in nature...), to let it be. Though the book is written by a minister and discusses spiritual traditions, it Though I'm not religious, the idea of Sabbath really resonates with me. I may not set aside regular time 'off' (not just talking about weekends here), but I certainly enjoy my down time. On one hand, I may feel as if I'm just being lazy--I should be doing 'something', but this book was a lovely reminder that this down time is a necessity. To reboot, relax, unplug, play (with others, music, in nature...), to let it be. Though the book is written by a minister and discusses spiritual traditions, it's not pushing any certain faith. I enjoyed examples of how people have found the balance between work and rest, and would like to engage in some of the simple practices mentioned in the book. Apparently 90% of Seattle's Orthodox Jews live within 1 mile of the 3 synagogues in Seward Park--I regularly walk my dog by 2 of them. I see folks in my neighborhood walking to synagogue every Saturday, and I have taken for granted their celebration of the Sabbath. From now on, while out on my Saturday walks I will take an extra moment to breathe in, breathe out, and count my blessings. This book really will teach you why and how to rest. At the end of each chapter is a exercise that helps you understand how to practically apply the ideas, which I find very helpful. This book really changed the way I though! A breath of fresh air in our current culture of rushing and straining. Muller spoke about the Sabbath both as the day of the week and of the soul, which is a take you don't often see. Reading this book slowly and meditatively is a Sabbath in itself. 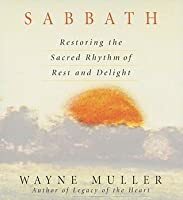 When I first sat down to write my book on the Power of Rest, I hadn't heard of this book on Sabbath. The consistency of observation as to what happens when a habit of rest is observed, therefore, is quite fascinating to me. From that perspective, I thoroughly enjoyed the book. I also appreciated the first-hand accounts of how other individuals observe Sabbath throughout the day and week. Concurrently, I was saddened by the underlying spiritual tone of the book. While the author presents many tea When I first sat down to write my book on the Power of Rest, I hadn't heard of this book on Sabbath. The consistency of observation as to what happens when a habit of rest is observed, therefore, is quite fascinating to me. From that perspective, I thoroughly enjoyed the book. I also appreciated the first-hand accounts of how other individuals observe Sabbath throughout the day and week. Concurrently, I was saddened by the underlying spiritual tone of the book. While the author presents many teachings of Jesus, it is done very academically and esoterically. Buddhist teachings are given equal, if not greater weight and other spiritual teachings from various religious schools of thought are presented as equally valid in living an abundant life. In some cases, a mix-n-match or mash-up approach is taken as to how to observe Sabbath, leaving one to believe that as long as it brings you rest for your soul, it really doesn't matter what is done. In a nutshell -- this wonderful book, published 20 years ago, consists of meaningful musings from a modern-day, religious idler and its subject - importance of the Sabbath - is both depressing and inspiring. It is discouraging to read knowing that the basis of the Sabbath is sadly more needed and relevant now than ever, especially as our society has only become increasingly distracted and disconnected in this media and device-addicted era. However, Muller's pre-21st-century perspective, means th In a nutshell -- this wonderful book, published 20 years ago, consists of meaningful musings from a modern-day, religious idler and its subject - importance of the Sabbath - is both depressing and inspiring. I grabbed this book at a used book store as I began my research for a study of the Sabbath. A quick glance gave me evidence of the easy reading of simple but revealing lessons and wisdom laid out by Wayne Muller. Seven sections with the titles of "Rest, Rhythm, Time, Happiness, Wisdom, Consecration," and "A Sabbath Day," follow his preface of "Remember the Sabbath." He talks at length about the lost cycles and rhythm of our lives which have been destroyed by the relentless societal drive of mor I grabbed this book at a used book store as I began my research for a study of the Sabbath. A quick glance gave me evidence of the easy reading of simple but revealing lessons and wisdom laid out by Wayne Muller. Seven sections with the titles of "Rest, Rhythm, Time, Happiness, Wisdom, Consecration," and "A Sabbath Day," follow his preface of "Remember the Sabbath." He talks at length about the lost cycles and rhythm of our lives which have been destroyed by the relentless societal drive of more, more, more. We end up saying too many times "I don't have time!" or "Where did my time go?" or "I don't have time to stop!" This pressure is literally killing us as people. Muller reflects that this is not what was meant to be when God issued His Fourth Commandment "Remember the Sabbath, to keep it holy." God "created the universe and all that in it is" in six days and on the seventh God rested. God's example to us of a rhythm of rest, refreshment of mind and body, replenishment and, at times, even sanctuary from the world. He opens each chapter and section with reminders of the Sabbath and its purpose through quotes, poetry or scripture, and he also incorporates the same into his easy to read and flowing text. After the chapter is an applicable exercise meant to do just that - exercise us in the practice of the Holy Sabbath Rest. In the final section, "A Sabbath Day," Muller lays out an example of what a Sabbath should be. How many of us seasoned Christians truly realize that Sabbath begins the sunset of the evening before the day as a time to slow down and prepare for the Sabbath that is beginning. A 'sader' meal prepared in advance and preceded with prayers and offerings of blessings all around the table, before the presentation of each course of the meal with an explanation of its significance. the practice of silence and even napping. Worship at your church is also course a part of that morning. Notice this is all meant to be restful and peaceful. He uses examples of what other families do during their Sabbath times. The evening is a period of reflection and ceremony around the 'havdalah' candle, "of grounding us together before we go back into our busy lives." [p231]. A bowl of spices can be passed around as another reminder of the sweet fragrance of this sharing of time together, "this aroma of rest" before everyone quietly begins to return to their separate ways. Read and heed the lessons of this book on The Sabbath experience. Experience the rest and the refreshment Muller means to bring. It is a radical change from the way the world tells us we "have to live." And God tells us "No. That is not the way. Take time for yourself and God to commune together in a not so new way. I have read this twice. It's such a refreshing reminder of all the varied aspects of Sabbath rest and what a tremendous gift this was to us. From literal Sabbath to how we can become Sabbath rest for others by being quiet and listening to their grief. God didn't rest because He was tired, He was still creating, creating peace, refreshment, and a time for reflection and glory to our creator. this is a good thing. For someone like me, that is always on the go, this was a critical read. Often Sabbath gets pushed aside so I can 'catch up around the house' or attend to other things. This book really addresses its importance along with a deep Biblical understanding of the different ways one can enter into Sabbath. The practice steps were intriguing and challenging for me. I was able to try a few new ways to approach my personal Sabbath. I don't know where I saw this book recommended, but I was expecting it to be a Christian book and I was mistaken. The author references Buddha more than he has spread. There are many new age philosophies and Unitarian views. the author does make some good points about the need for rest, but as a Bible believing christian that's about all I got out of this book. Even reading two pages in this book left me with a deep, still sense of peace. This book so beautifully highlights the need for rest, for time to slow down, for time to appreciate. Nothing in nature is blooming all year round, Muller points out, so we need to take time too to let ourselves rest and become revitalized. Keep a pencil nearby, because there's a lot to underline! Some really great points in this book that I appreciated, and that were wonderfully challenging to me. However, the author’s theology is entirely counter-biblical and I found that even though he had a few true things to say, many things he said came from a place of untruth. I absolutely love this book! It’s a good reminder of how to live life.., I try to read it about once a year because I need a refresher. Life gets busy and stressful, but that’s now how God intended us to live. Have to rate 5 stars as it was a gift from my kids reminding me to slow down and take time for self and for rest. The fact that it took me 8 months to read reminds me I needed it. When I finally decided to read a chapter a night, it was a great way to take that special time for self. A good book on holy play, obedience to God where rest is concerned and how Sabbath allows our natural resources to recuperate once used. Still trying to figure out what Sabbath means to me. “Like a path through the forest, Sabbath creates a marker for ourselves so, if we are lost, we can find our way back to our center."